Skills Based Approach is meant to simplify. Students and professionals work with an evolving skill set and constantly cycles through four stages to stay relevant. There are many strategies for education and career planning, one of them is about becoming self and socially aware before making any decisions. Take any results, translate them to skills and create a plan to move forward. Intelligences. When I think of intelligences, I think of cognitive, emotional, creative, and contextual (but there are other interpretations). Last week (05/2017) Bill Gates mentioned how students should consider one of nine intelligences as they plan their career. 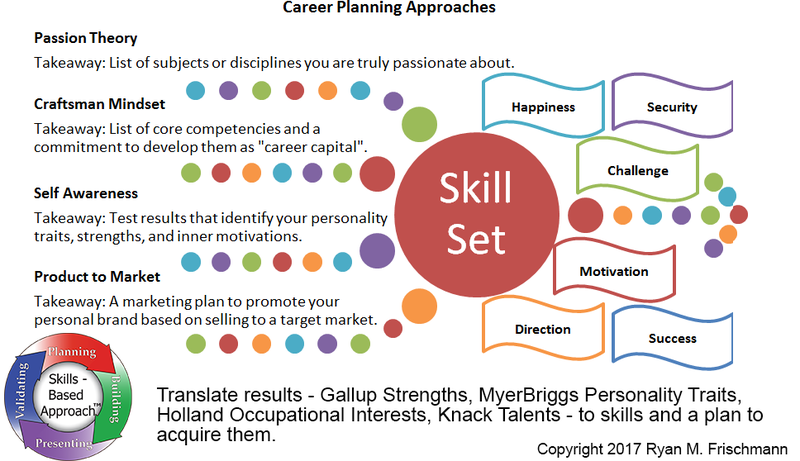 Regardless of the source, figure out what intelligences you have a natural aptitude, then translate into skills and an action plan to build the skills. Gallup Strengths. Gallup has been working on improving employment engagement, leadership, and team building for decades. Their surveys resonate with a nationwide audience. One of their services is StrengthFinder, where users take online tests to discover their top strengths (weaknesses too). (I think) there is something exhilarating about discovering your strengths and sharing them with your advocates – team members, mentors, coworkers, etc. Everyone signals to each other: “this is what I do best”. The advantage in mapping your strengths to skills is: “putting your best foot forward”. I took the test once while working towards an MBA and again ten years later, surprised to get the same results. My top strengths are learner and enterpriser. For me, my strengths fit precisely with my skills: business management, business strategy, idea generation, technical writing, and research. Jung Personality Types / Holland Occupational Themes. Myer Briggs is a gold standard for testing for Carl Jung personality types. These tests have been around for forty to fifty years. Before the test was on paper, now there are many variants you can take online in about twenty minutes. Tests for Holland Occupational themes are focused on career themes. Knack Talents. Play games to identify disciplines or area of expertise to pursue, ‘knacks’. There are advantages in playing games to determine possible careers. They involve simulation (as opposed to self-assessments) and are supposed to be fun (not a boring multiple choice test). Simply plug in any new technologies and applications into Skills Based Approach to get desired results.